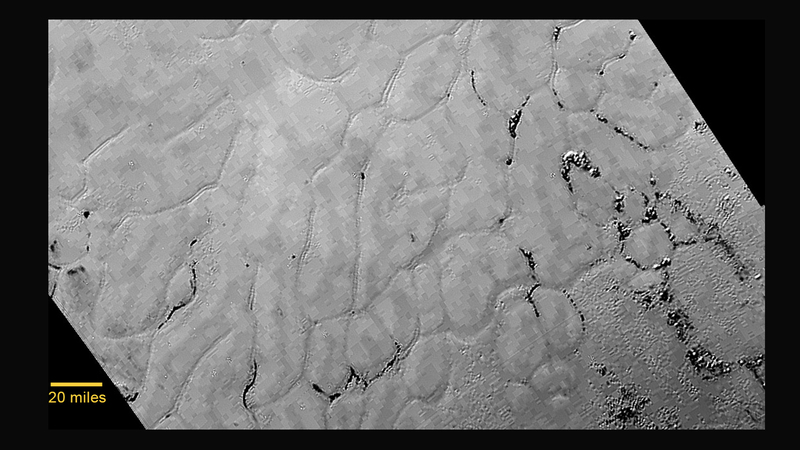 Pluto’s Norgay Montes, 3500-meter-high ice mountains south of the Tombaugh Regio “heart” feature. Just northeast of the Norgay Montes, in the “heart of the heart” lie crater-free, smooth plains of frozen material – possibly carbon dioxide ice mixed with nitrogen and methane as well. Within this region informally named Sputnik Planum arge polygonal shapes are marked by long troughs, some of which contain deposits of darker material. What’s so interesting about this area is how young it must be to exhibit no craters – according to New Horizons geologist Jeff Moore, some of the surfaces could be “only a week old as far as we know!” How the region formed is still (like most of these new discoveries) a mystery. Read more here. Some of the rises in Sputnik Planum show dark spots with streaks appearing to extend outwards from them. 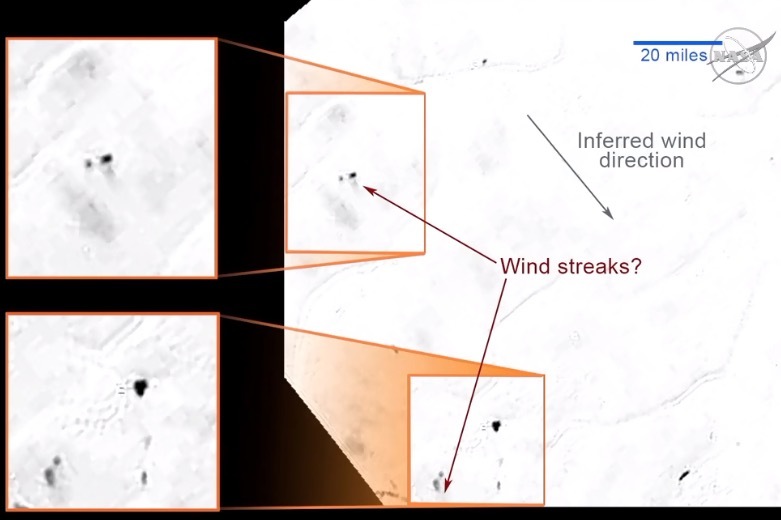 While speculative of course, the causes of these streaks could be either falling hydrocarbons from higher in the atmosphere that have deposited and been swept along by prevailing winds, or more intriguingly staining from active plumes of darker material issuing from below the frozen surface (like what Voyager 2 observed on Neptune’s moon Triton.) Without having seen plumes in action in New Horizons data (yet) it’s hard to determine for sure which scenario is the case. Pluto has a lot of atmosphere! The New Horizons Atmospheres team saw data on Pluto’s atmosphere extending outward from the planet up to 1,000 miles (1,600 kilometers), confirming that Pluto’s nitrogen-rich atmosphere is larger than it could ever be observed from Earth and relatively larger than our own atmosphere. 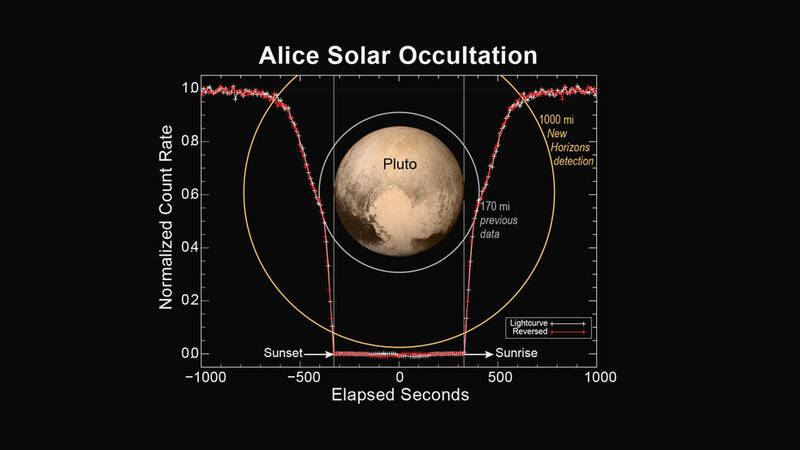 It’s the first detection of Pluto’s atmosphere over 170 miles (270 km). What’s more, Pluto’s atmosphere shows little variation from limb to limb – while not completely “stagnant” it appears to be nearly identical on either side as observed when Pluto briefly passed in front of the Sun from the departing spacecraft’s point of view. Read more here. 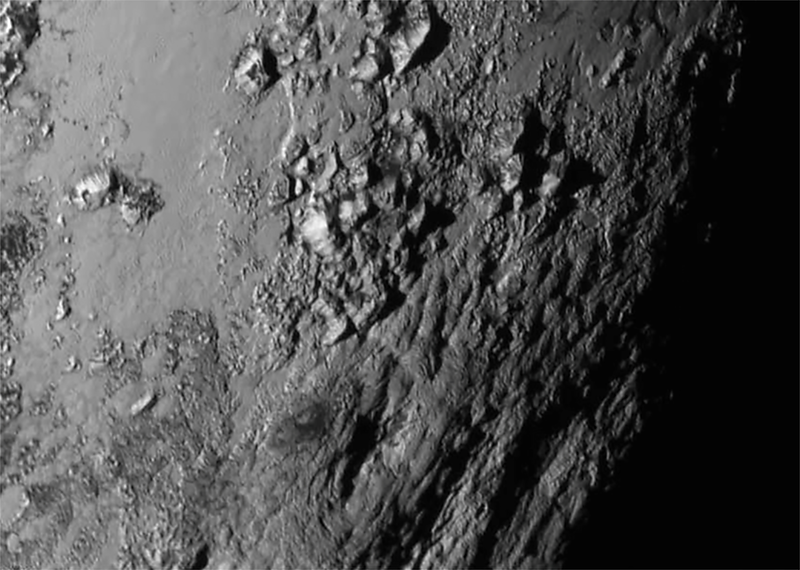 Neil deGrasse Tyson once joked “I love Pluto – it’s my favorite comet.” (That was a joke, wasn’t it Neil?) And while Pluto doesn’t have a million-mile-long tail like some of the more gregarious comets that have passed though the inner Solar System, it does have a dense cloud of cold ionized gas streaming out to 68,000 miles (109,000 km) behind it, the result of its nitrogen atmosphere being steadily stripped away by the solar wind. 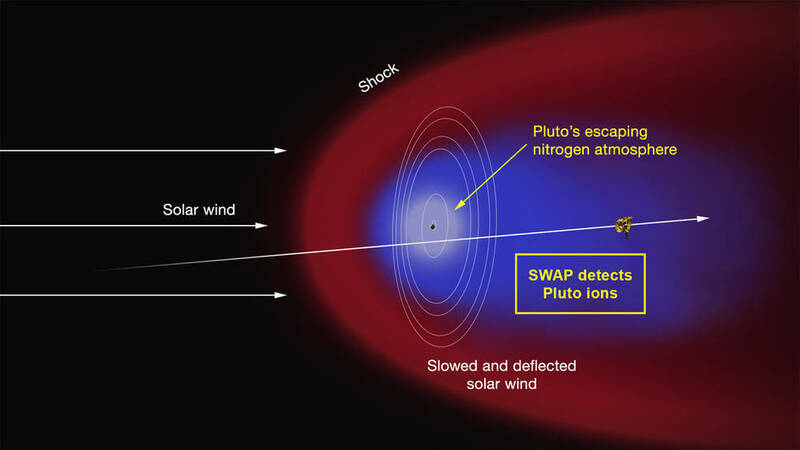 “This is just a first tantalizing look at Pluto’s plasma environment,” said co-investigator Fran Bagenal who leads the New Horizons Particles and Plasma team. Read more here. 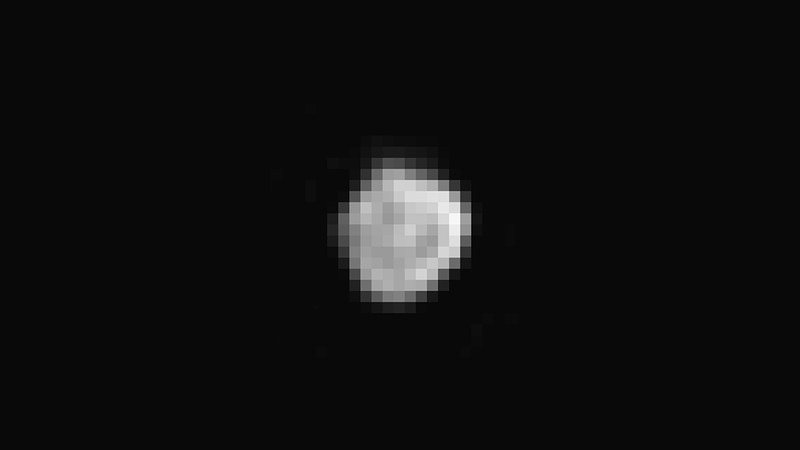 LORRI image of the 25 mile (40 kilometers) wide Nix, captured on July 13, 2015 from a distance of 360,000 miles (590,000 km). You’re right this presser was at NASA HQ. Previous ones were at APL.